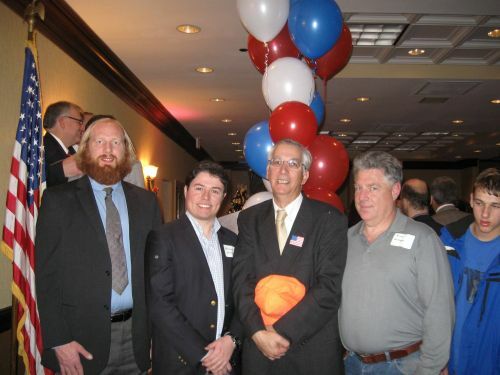 Here is Jon (photo above) at my 2011 Swearing In Ceremonies with my key campaign leaders (he is to my extreme right. left to right: Jon Nolte, Michael Monrroy, ED, Jerry Vollenger, unidentified volunteer. Sorry to tell you, dear Sterling, bad news. Jon Nolte, who worked in a previous 2011 campaign, has passed away in a car accident Monday Dec. 14. I am extremely sad as I know many of you are at this terrible news. I notified former staffers, posted on various social sites and today posted it on my permanent site. I have been collecting photos too. God protect all of us and Jon today and always. Jon Noltie was a gentle giant who kindly sacrificed for the patriotic and conservative cause of this nation all his life. He was tall, had a tremendous red beard and hearty appetite which we would attempt to satisfy be frequent visits to Joe's Pizza at the unlimited food table. I was fortunate to know him from his devotion to my own fledgling campaign in 2011 (local supervisor, sterling, va.) and he flung his considerable energy into my fourth re-election campaign. Jon was always met with enthusiasm and I suspended the campaign for one spontaneous rally cheering Jon on the occassion of some campaign success. 25 of my workers converged on the location Jon was at in Sterling, Va. to cheer him and thank him for his achievement (Jon found a lot of lost political signs we were all searching for). Jon single-handed discovered and recovered 50 Delgaudio for Supervisor campaign signs in one area hidden from public view. We arrived from all directions to that corner to celebrate Jon's discovery. He was always humble and allowed us to cheer him and hold him up as the hero he is and always will be to all of us with less stature. Thank you Jon for your strong faith and leadership that sustains our conservative values. Thank you to the family for raising up such a selfless and humble American.